Solenoid valves are used throughout many commercial, municipal, industrial, and even residential settings to manage fluid flow. 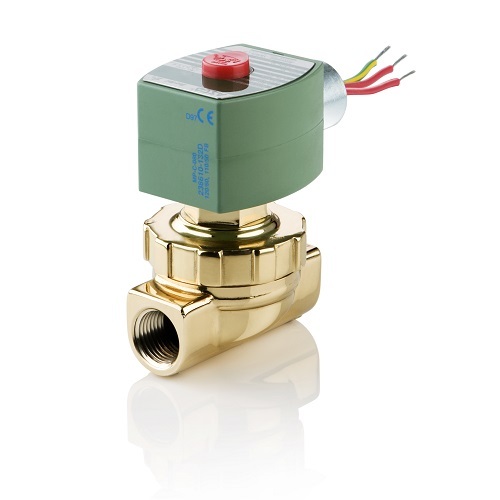 What we refer to as a solenoid valve is an integrated valve and actuator. The actuator, or solenoid, operates via electric current flowing through its helix shaped coil. Energizing the coil with a control signal produces a magnetic field, which then actuates the valve mechanism. Depending on the port configuration of the valve, solenoid valves can either function as two way flow controllers or as diverters in a process system, If the valve contains two ports, then the valve is an on/off valve. If the valve contains three or more ports, then the valve directs the flow of a fluid in the process system. Thanks to their flexibility, reliability, and need for only a small amount of control power, solenoid valves are a frequently used fluid process control device. The solenoid used in a solenoid valve functions as a converter for electrical energy, using the supplied electrical energy to produce mechanical energy. Metal or elastomeric seals on solenoid valves can be coupled with electrical interfaces, allowing for relatively easy operation by the process controller. The valves typically use a metal plug to cover up a hole, and when pressure from the process fluid is applied to the valve, the pressure difference causes the solenoid valve to be in its normal position. Instead of referring to two directions of flow, the two-way solenoid valves are named two-way because these valves contain two valve ports which the fluid uses to travel. Three way valves, similar to the name of the two-way valve, have three fluid ports. In an application example, these ports could correspond to pressure, exhaust, and cylinder. In a pneumatic system, these would be used for compressed air supply, vent, and the actuating mechanism. Regardless of the application, the valve function is the same, connecting the inlet port to one of two outlet ports. 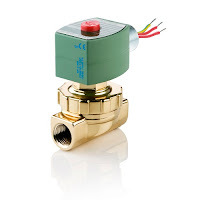 The selection array of solenoid valves for commercial and industrial use is vast, with variants suitable for a wide range of media, pressure, temperature, and operation sequence. Pneumatic and hydraulic systems are typical applications for solenoid valves, as are processes such HVAC, where solenoid valves help control liquid refrigerant, as well as suction and hot gas lines. Solenoid valves are a popular fluid flow control options used in processing industries. Share your fluid control requirements and challenges with application experts, combining your own process knowledge and experience with their product application expertise to develop effective solutions. Watch the video below for more on how solenoid valves work.